While North America has been fairly quiet this winter on the avian flu front, in December an (ongoing) Outbreak of multiple strains of bird flu broke out in France, while Scotland, in mid-January saw an Avian Flu Outbreak Confirmed As LPAI H5N1. On January 19th DEFRA offered a DEFRA: Preliminary Outbreak Assessment - LPAI H5N1 In Scotland, which found the H5N1 was unrelated to both the Eurasian H5N1, and the outbreak in France. Unlike the H7N8 outbreak in Indiana, and last year's outbreaks in the UK and Germany, and France, the Low Pathogenic virus in Fife didn't mutate into an HPAI strain once it entered the commercial flock. Today the UK's APHA (Animal & Plant Health Agency) has released a detailed epidemiological report on the outbreak. The 32-page PDF file may be downloaded from the link below, but I've included the executive summary. 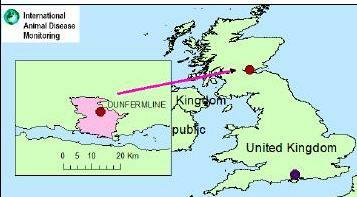 DESCRIPTION OF THE PREMISES: The Infected Premises (IP) designated as AIV 2016/01, is a 40,000 broiler breeder laying unit, located approx 8km north of the Firth of Forth estuary in the east of Scotland. The birds are owned and managed as a stand-alone unit. It operates as an intensive (indoor), barn style production system, and eggs for hatching are collected and delivered to a hatchery in Berwickshire, Scotland. DESCRIPTION OF THE VIRUS: It has been concluded that this H5N1 low pathogenicity avian influenza virus is a conventional European lineage virus exhibiting biological properties consistent with contemporary LPAI viruses that are occasionally detected in the EU in domestic poultry, and whose closely related progenitors are maintained in wild waterfowl populations. 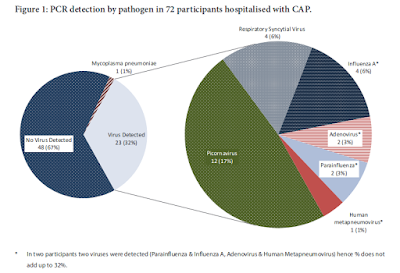 The virus is clearly distinguishable from viruses associated with the ongoing epidemic in France, and distinguishable from the group of HPAI viruses that have caused a global panzootic in the last 10 years. The genetic analyses suggest that all eight genes are of avian origin, without any specific increased affinity for humans. SOURCE AND SPREAD WINDOWS: The most likely time that LPAI infection is estimated to have entered the IP is around 26/12/2015, with a maximum precautionary source period over which tracings were investigated from 11/12/2015 to 31/12/2015, a day before the precautionary start date for onset of clinical signs. The high risk spread window for LPAI virus opened on 27/12/2015, with the spread window extending until 09/01/2016 (when restrictions were imposed), with a maximum precautionary spread period over which tracings were investigated extended back to 12/12/2015. HYPOTHESIS FOR THE SOURCE: The epidemiological investigation has concluded that the most likely source of the outbreak is considered to be indirect contact with wild birds. EVIDENCE BASE FOR THE SOURCE: This assessment of the source is based on the evidence that: (i) the genetic analyses of the virus indicate a relatively recent introduction from the wild bird population, (ii) there are a number of water bodies in the vicinity where wild fowl have recently been sighted, (iii) there has been a flooded field adjacent to the farm with water fowl sighted in the water, (iv) the IP is in the direct flight pathway between a waste disposal site and Loch Fitty, (v) findings from the official investigation suggest deficiencies in biosecurity on the IP which may have led to introduction of virus, (vi) there is a small risk of fomites (e.g. feathers) being sucked in through the roof of the two houses thought to be the first infected, (vii) there is no evidence suggesting introduction of infection into the houses via direct contact with wild birds, (viii) there have been no other cases of H5N1 identified to date in domestic poultry in the UK, and (ix) there were no poultry or eggs brought onto the IP in the source window and there is also no evidence of contaminated product being brought on. ASSESSMENT OF POTENTIAL SPREAD: Following extensive investigations, no evidence of avian influenza virus infection has been found on other poultry premises identified as tracings from the IP, or reported on other domestic poultry premises in the United Kingdom.